You might be surprised at how easy it is to break most locks that are on doors today; locks can be picked and low-quality deadbolts easily kicked in. When your residential security is vitally important to you, consider a high security lock for your home. A high security lock is one that is specifically designed to make it difficult if not impossible to break or jimmy open. Most tumbler locks are very inefficient; a person can work the tumblers so that they're all in a row with a simple paper clip or pin, if they work at it for a few minutes. Low quality locks are also easy to break open with a good swift kick since they're typically made with thin metals and poor quality elements. 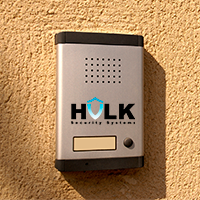 For the best quality assurance and highest level of home security services, Hulk Security Systems ensures that you get only the most advanced lock systems available. The best high security lock brands in the industry are Mul-T-Lock and Medeco, and these brands have built a reputation for creating a strong product that is virtually impenetrable. The keys that match these locks are difficult if not impossible to copy, so even if you lose your keys or have them stolen, you don't need to worry about copies being made. When ready to choose a high security lock, you also have the choice of a cylinder lock or deadbolt or other designs, all of which are meant to keep you as safe and as secure as possible. This will mean knowing your family is safe as well, since standard door handle locks offer little by way of protection for you.